I love bringing all of you great cash giveaways because, if you are anything like me, some extra cash can go a long way toward your goals! I mean, who wouldn’t want someone to just give them $500 cash? Let me think: What would I do with $500? I would buy some needed summer clothes and shoes, some new baskets or organizers for my kitchen and office, a lamp for my office, or maybe splurge on a nice dinner out! It is also totally possible I would use it to pay off bills or the car a little faster. Either way – extra cash is a win-win! 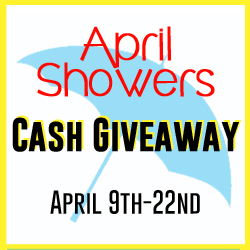 But enough about me – Let’s get you to the $500 April Showers Cash Giveaway!! Enter to win $500 cash via PayPal by completing the tasks below to earn entries. Refer your friends using your unique link to earn even more chances to win. What would you do with the extra cash?